I just finished some fun fall watercolor journal pages. I’m taking Junelle Jacobsen‘s The Art of Holiday Goodness online workshop. It just started a couple days of go and has already been so much fun. 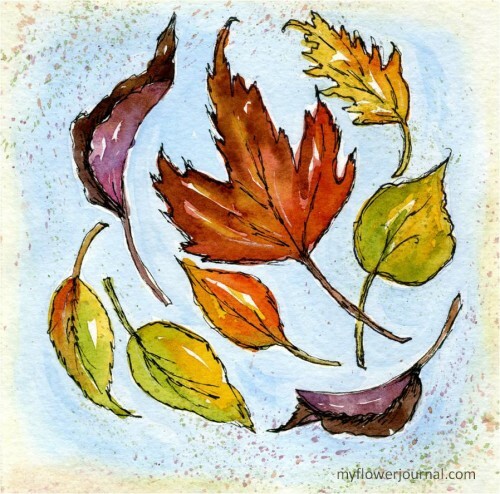 The first project we did was to collect fall leaves, sketch them, add watercolor and some pen detail at the end. Junelle had some good tips for making fast, loose sketches. Sketching is something I need to work on so this was a good demo for me to watch and try. She also showed us how to do some silly fall sketches. One of my sketches turned into a page with border that needed something to go in the middle of it. I decided to add my favorite fall recipe. 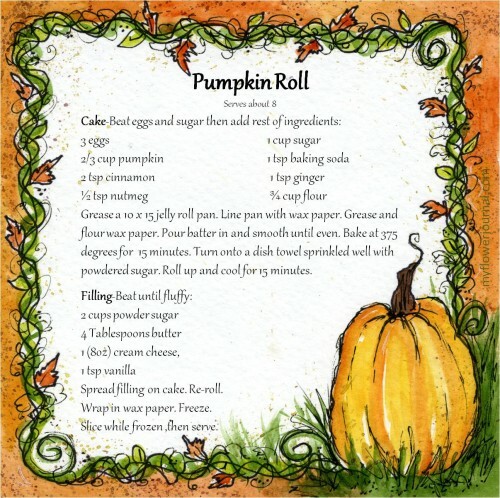 I love pumpkin pie, pumpkin chocolate chip cookies and pumpkin bread, but pumpkin rolls are my favorite fall dessert! You can download this recipe here and print it for your own use. 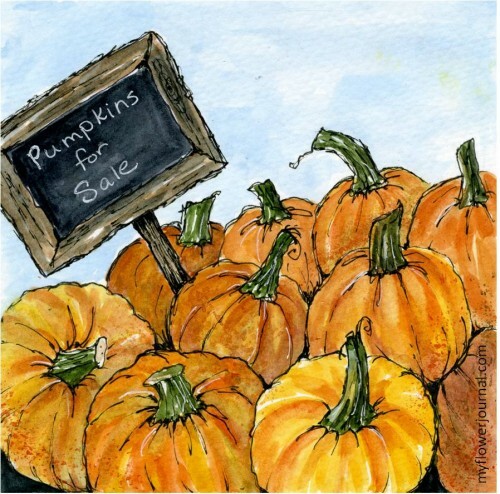 You can find more of my fall watercolor project ideas here. Another great art journaling class available on Craftsy. My wife is so talented. Anyone agree? You are so talented! I love the blue in your fall paintings and the leaves and pumpkins both glow in its presence. Happy October images for adoring fans of the season! These leaves are beautiful! The class sounds like fun. I will have to check it out! Also I love the pumpkin patch. and the border that is around your recipe! I am not a pumpkin pie fan but I love pumpkin rolls. Thank yo so much for the recipe! I agree with your hubby! I love your style of drawing! So homey and cozy. I am sending this off to my husband to print because I don’t have color ink! Visiting from Be Inspired. Love your pages. Glad to see more of your garden journal. Love your sketches! I think this would be so fun to try. It’s funny. I don’t care for pumpkin pie, pumpkin cookies, but I love pumpkin roll! I think it’s that cream cheese. lol! Beautiful artwork! Thank you for sharing. I love the pumpkin roll recipe. Thank you for visiting my Pink Journal post. I love your water color art. I love painting with water color but yours is just lovely. I wish I could paint like this. Have a lovely day. That’s just so amazing! I love the colors and the way you do the outlines… really inspiring!